Jesse Eisenberg stars in the new comedy 30 Minutes or Less. He plays Nick, a directionless twenty-something perfectly content with the freedom and pocket change his pizza delivery job affords him when he crosses paths with Dwayne (Danny McBride). Dwayne is an even more directionless thirty-something who has grown tired of waiting for his inheritance. 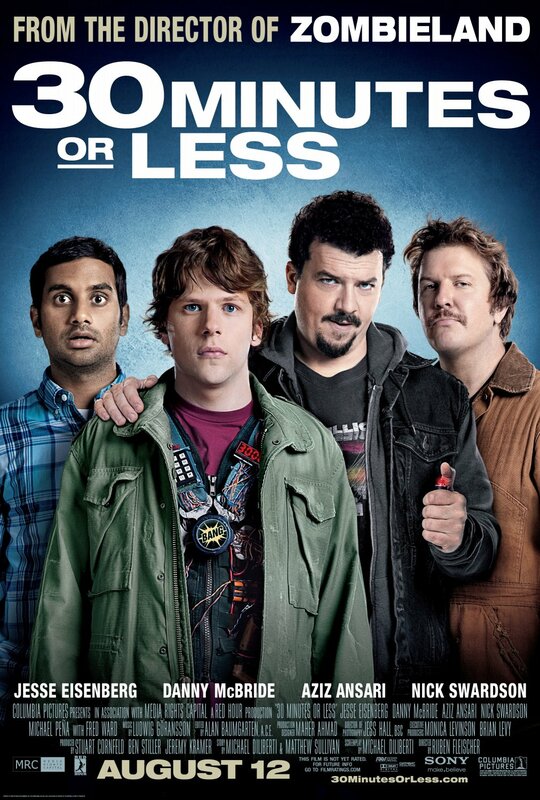 In an attempt to hasten his birthright, he and his friend Travis (Nick Swardson) devise an elaborate plan. They need quick cash to hire a hitman so they kidnap Nick, strap a bomb to him and then give him 12 hours to rob a bank. Eisenberg is solid in the role and has great chemistry with Aziz Ansari, his partner in crime. McBride’s performance is a minor variation on his Kenny Powers character (and I can’t stress enough the word “minor”). Adding to the inevitable Eastbound & Down comparison is the fact that Swarsdon, his sidekick in the film, bears a striking resemblance to Steve Little, McBride’s sidekick in the show. And while there are laughs to be had I could never quite shake the notion that it should’ve been funnier; especially with a cast this strong. The film is directed by Ruben Fleischer (Zombieland) who, as he did in that film, enjoys attacking genre clichés from new (and comedic) angles. But, sadly, this is no Zombieland. It’s not a bad movie; it just never reaches the dizzying absurdity of his previous outing. Fleischer keeps things moving along at a brisk pace. How brisk? Well, the movie clocks in at a scant 81 minutes. And while he was wise to not wear out his welcome, it’s difficult not to walk away feeling like the whole thing was “lightweight”. August is typically a dumping ground for films. Not as bad as January, mind you, but still. By August standards it’s solid. If you like this cast, then you’ll like this film. And I wouldn’t be surprised to see it become a bit of cult film. But then again…I wouldn’t be surprised if it didn’t. On a scale of 1 to 10, with 10 being Pineapple Express and 1 being Yo! Noid, 30 Minutes or Less gets a 6.